Fresh fruit tastes even better when it’s dipped into this easy, refreshing blend of MIRACLE WHIP, strawberry yogurt and frozen strawberries. This fruit dip recipe is a keeper. PURÉE 1/2 cup Miracle Whip Calorie-Wise Dressing, 1 cup strawberry yogurt and 1 pkg (300g) frozen strawberries, thawed, in blender. 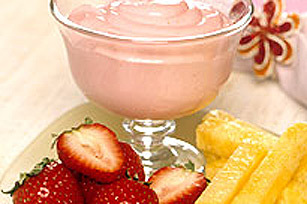 SERVE with 10 cups sliced fresh strawberries, pineapple, bananas, apples or other fruit.